Thabo Sefolosha encountered the NYPD at a club. A fellow NBA player had been stabbed. This interaction ended with Sefolosha being done for the season. Let’s not “bury the lead” here. At a moment when people across the country are reckoning with the deadly reality of police violence and the terror it imposes on black communities, the New York Police Department fractured the leg of a player in the National Basketball Association. The NYPD had an interaction with Thabo Sefolosha of the Atlanta Hawks, and they broke his damn leg. Sefolosha’s damaged fibula comes after a season when NBA players spent last winter making statements against police violence, after the killings of Michael Brown and Eric Garner. It also comes at a time when police brutality is under an exacting microscope following the execution of Walter Scott by Officer Michael Slager in North Charleston, South Carolina. In the blinkered reality of the sports world, the big story is that the damage to Sefolosha has happened right when the Atlanta Hawks are about to enter the playoffs with the best record in the Eastern Conference, jeopardizing what has been a dream season. Now, unless they make a deep playoff run, it will be remembered as a dream trapped between nightmares; a squad whose season began under a cloud of racist controversy, with the ugly leaked interactions between owner Bruce Levenson and general manager Danny Ferry, and now ends under a similarly colored cloud. 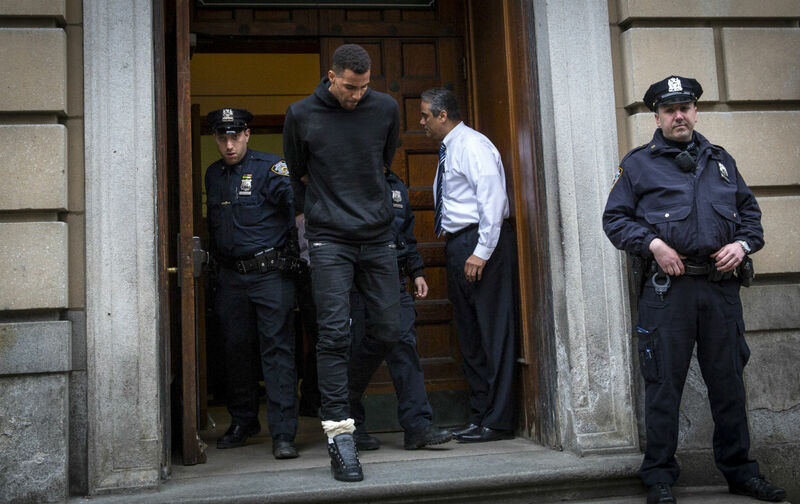 How in the hell did the NYPD come to injure Thabo Sefolosha? One moment fellow NBA player Chris Copeland and Copeland’s girlfriend Katrine Saltara were being stabbed at a trendy Chelsea nightclub (both are in stable condition), then Sefolosha and his Atlanta Hawk teammate Pero Antic were being arrested for obstruction… and then a broken leg. As for how Sefolosha’s fibula was fractured, there is the police version of what went down and then there is Thabo’s version. Stunningly, several outlets including ESPN first printed the police’s version as fact. If nothing else, the death of Walter Scott should be a lesson to all of us that there is a chasm between what the police can say happened and the reality of a situation. As members of the Atlanta Hawks, we hold ourselves to a high standard and take our roles as professionals very seriously. We will contest these charges and look forward to communicating the facts of the situation at the appropriate time. We apologize to our respective families, teammates, and the Hawks organization for any negative attention this incident has brought upon them. We are unable to provide further comment as this is an ongoing legal matter. We do have a videotape of what took place*, but all it reveals is multiple police officers jumping the rail-thin 6’7″ 220 pound Sefolosha. Ironically, or tellingly, his fellow-arrestee, Pero Antic, has an appearance we’ll describe as ornately terrifying. Tattooed, bald, seven feet tall and over 260 pounds, he is a Macedonian guy who happens to be white. Sefolosha is a Swiss guy who happens to be black. The terrifying seven-footer walked away and the guy from Switzerland was jumped. Whether or not racial bias was involved, the optics of this are very familiar to anyone who has followed the methodologies of the NYPD. In time, we will find out what happened. Sefolosha has the deep pockets and the lawyers to either wrest some justice out of this situation or, if it is determined that he did obstruct justice, make it go away. But in the league, it will be seen as bigger than one case, one confrontation, one injury. This is the year when the NBA intersected with the #BlackLivesMatter movement. Perhaps after a several month lull, players or the NBPA** will have something to say, if not about Walter Scott, then about Thabo Sefolosha. The message from NBA players last winter was that “what happened to Michael Brown or Eric Garner could happen to me.” Well, police violence has come home. This is bigger than the damage the Hawks have suffered to their title dreams. It’s about whether fame and fortune can buy safety in the United States, if one also happens to be living while black. * Since the publishing of this article, another video of the arrest has been released, which shows a member of the NYPD unsheathing a nightstick and either expanding it or striking Sefolosha while he is on the ground.